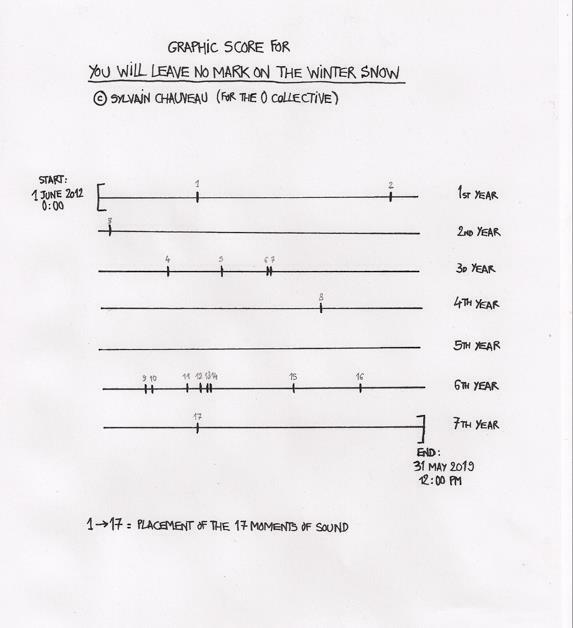 "You Will Leave No Mark In The Winter Snow" is a music piece by Ensemble 0 whose duration is extremely long: 7 years. A suite of extremely short, ultra-minimal pieces Chauveau composed for his Ensemble 0 in 2011-2012, entitled "17'16 for Morris Louis". Music inspired by the American painter (1912-1962). All track titles refer to a canvas. Sylvain Chauveau from the Ensemble 0, has made solo records on labels such as FatCat, Type, Les Disques du Soleil et de l'Acier, Brocoli, Flau, Nature Bliss, Creative Sources: minimal, quiet compositions for acoustic instruments, electronics, and voice. He performs worldwide and has made remixes for various musicians and bands. He has composed a 7 year long piece entitled You Will Leave No Mark On The Winter Snow, full of silence and featuring only 17 moments of hearable sounds, that is playing online until 31st May 2019 on 7 years of Silence. He runs the label Onement, where the concept is to release one-copy LPs, and co-runs (with Florent Garnier) I Will Play This Song Once Again Records where the artists have to re-record their songs for each buyer. He also makes soundtracks for feature films and dance shows. Sylvain Chauveau is a member of the 0 ensemble (with Stéphane Garin and Joël Merah), of Arca (with Joan Cambon) and of On (with Steven Hess).